I found this novelty fabric at J&O Fabrics. I have seen it before, but this is the only vendor I can currently find it from, so I suspect it may have been discontinued. I hope not. I really like it.. At the moment, they have 8 yards left in stock. It is designed by Patrick Lose and sold under Timeless Treasures. 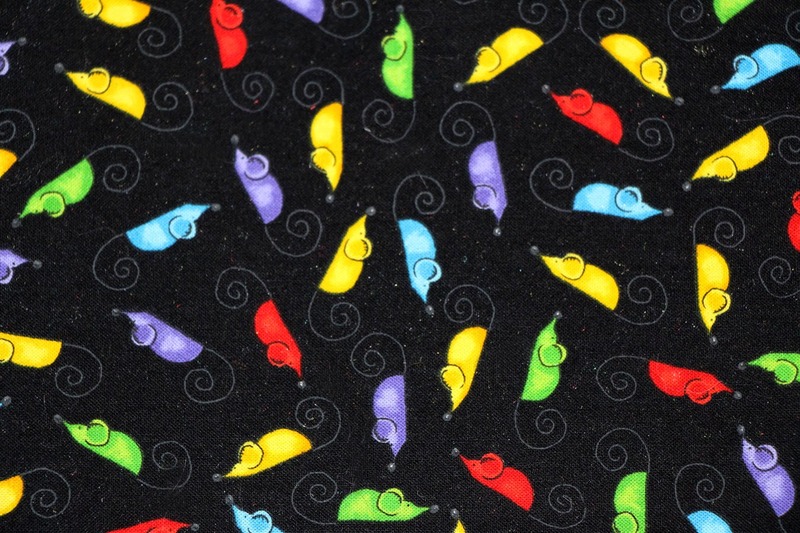 This is perfect hammock making fabric. 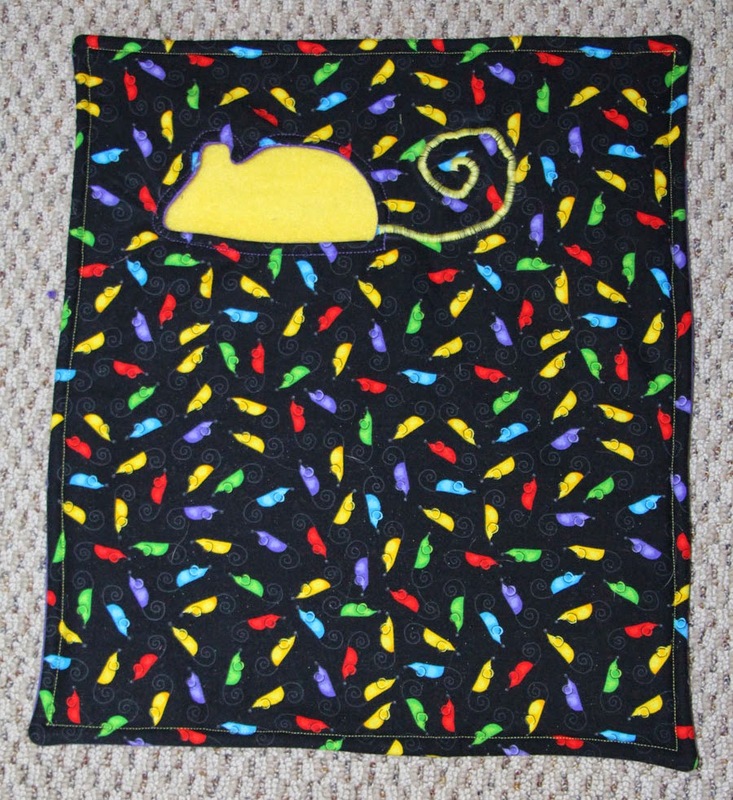 The mouse (rat) theme is one that is not easy to find - or when I do find it, it tends to be too mousy for my tastes. But theme aside, the bright primary and secondary colors set off against the black background make the coordinating fleece colors really pop. I used some of the Rigilene designs in this set. The tube is held open by rings of Rigilene, keeping the openings from collapsing flat when hung. 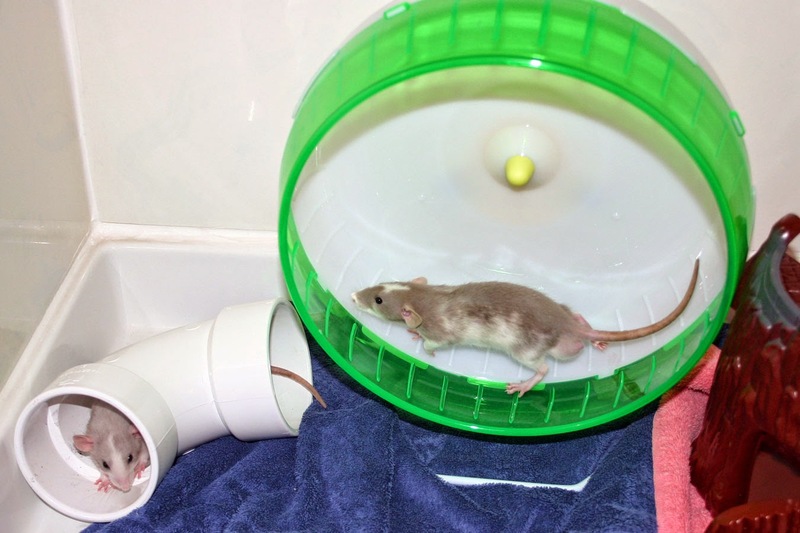 I am trying out a tunnel with a strip of Rigilene across the top to keep the entrance from falling backwards when left unattended in the cage. We will see how well that holds up. I also used a strip of Rigilene sewn into the cuff of the snuggle sack to keep the sack open in the cage. My rats have never been especially fond of snuggle sacks, so I thought I would try this and see if it is more inviting this way. And finally, I made a cuddle cup with a Rigilene frame to keep it from collapsing. Bela is really a fan of the cuddle cup, especially when it doesn't end up squished and flattened in the cage. I made the cuddle cup as described in the tutorial, but built a Rigilene frame like the one shown to the left, and sized it to fit perfectly inside the cup before sewing the cotton/batting cup (outside) to the fleece cup (inside lining), ensuring enough fabric is left above the frame for the seam connecting the cotton to the fleece. 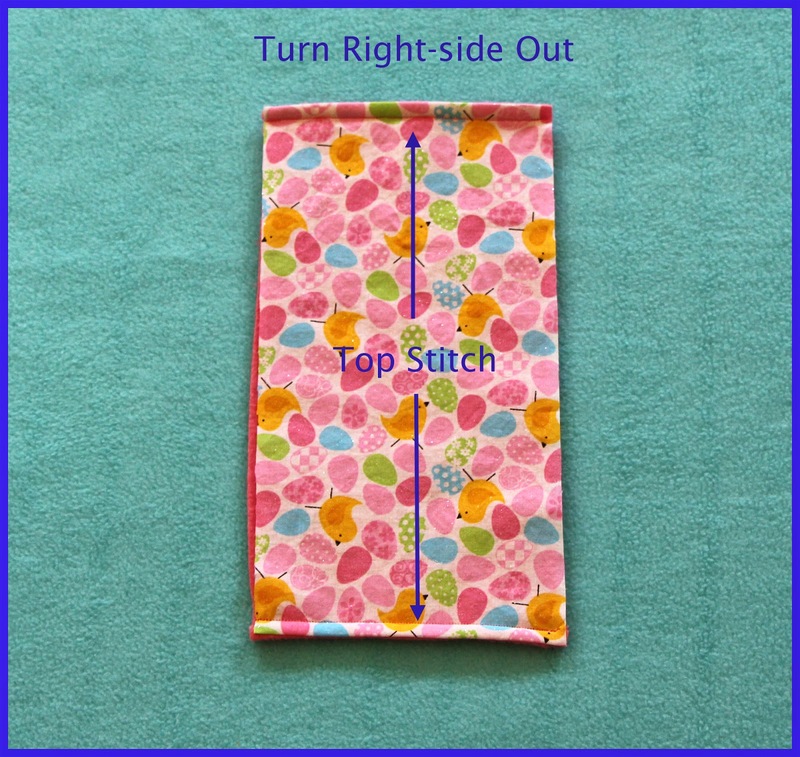 Once sized, the frame is removed from the cuddle cup and the cotton/batting cup is sewn to the fleece cup as described in the tutorial, only making the opening through which the cuddle cup will be turned right-side out about 3 1/2" wide. 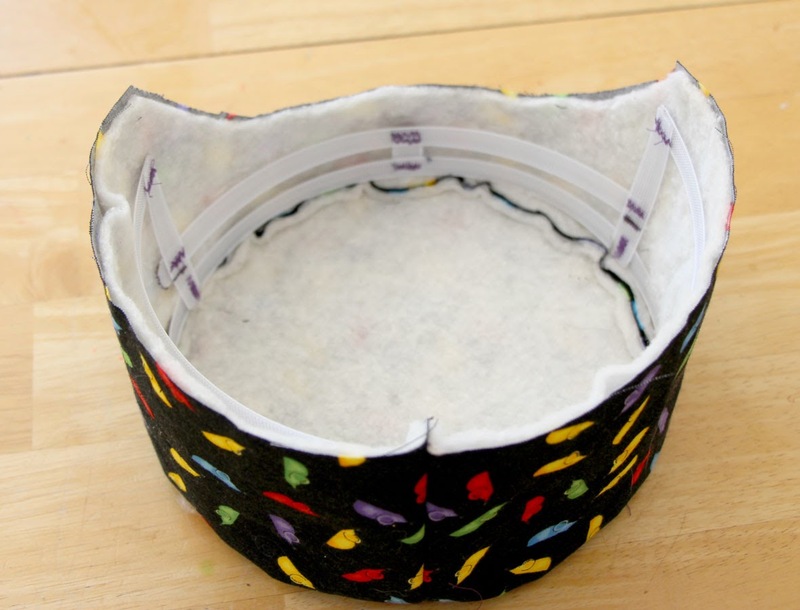 After turning the cuddle cup right side out through the opening, I inserted the frame (it is flexible) inside the cup through the opening, then slip stitched the opening closed once everything was positioned correctly. The only problem I have with this cuddle cup is the top stitching. For some reason, I can never top stitch this item neatly when the Rigilene is in place. 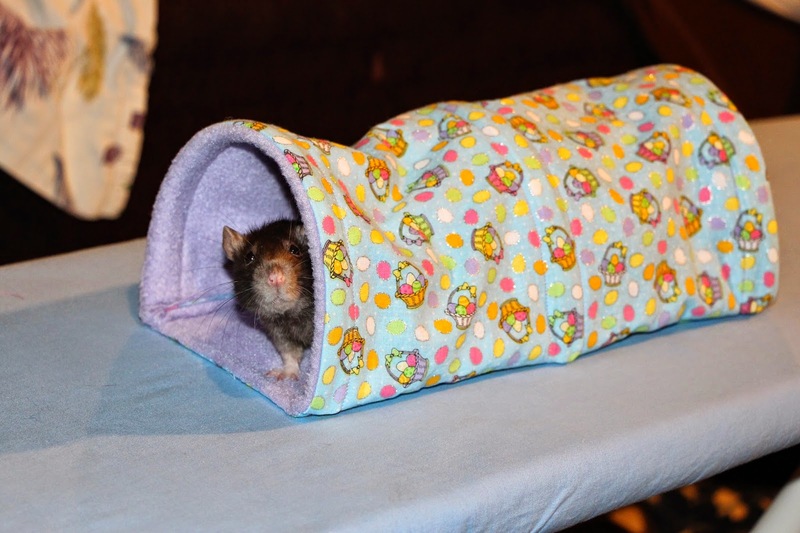 I couldn't resist the opportunity to create a Peek-a-boo hammock with a rat-shaped opening. 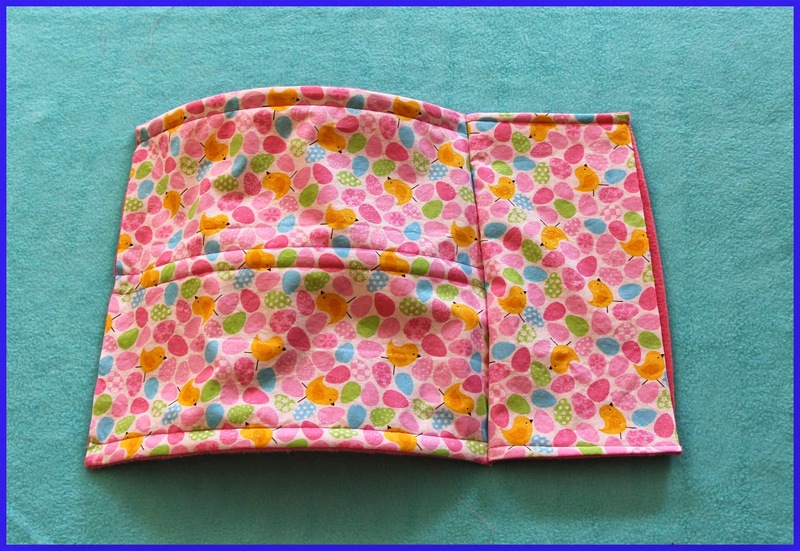 I added a zig-zag stitched spiral tail to complement the spiral tails on the fabric. The following is the DCN decked out in the mouse/rat themed hammocks. I am in the process of making some for Casper as well. Who's a Cancer Rat? I Don't See Any Cancer Rats! Casper has been on steroids for a week now. I am not sure whether it has had any effect on the tumor, but it has definitely helped his appetite. He still is not eating dry solid food, but he is eating more of the softer foods. He takes yogurt with strawberry Ensure very well, so that is helping him get his nutrients. He is also eating quite a bit of turkey and sweet potato baby food. He accepts scrambled eggs, hard boiled egg - particularly the yolk, and even an eggfood I make for my birds, consisting of finely grated hardboiled egg, breadcrumbs, and finely grated carrot. He will also have a bit of oatmeal. And he will occasionally pick from other foods (broccoli, banana, grapes, sunflower seeds, lettuce) - the other day, he swiped a piece of Cinnamon Toast Crunch from my son and ate the whole thing. 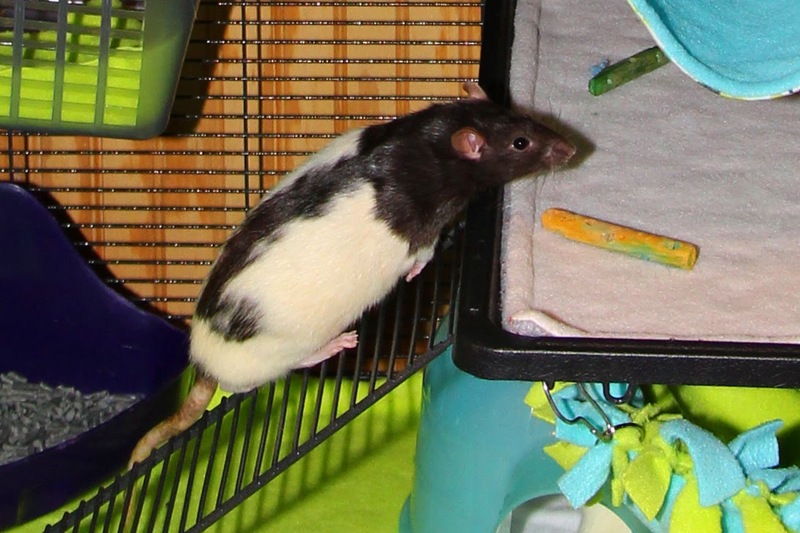 Okay, Cinnamon Toast Crunch isn't high on my list of rat treats, but when you have been diagnosed with a massive lung tumor and your time here is short, you can have a piece of Cinnamon Toast Crunch if that is what you want. Anyway, he is broadening his dietary horizons and is eating more of the things he was eating before. I weighed him last night and he had gained 20 grams over what he weighed at the vet a week ago, so it is not just my imagination. And to be putting on weight instead of losing it is a really good sign. I always fear with advanced illness like this that malnutrition from poor appetite is likely to do a rat in before the illness itself. So it is really good to see him eating better and putting on weight. Casper was looking really good Thursday morning, so I took him out for some photos, hoping to get something I can use for a Memorial Day picture. Wow, does the camera love him! He looks so good that I don't see any hint of Cancer Rat in him! It is so wonderful to see him looking so good, I wanted to share some of his photos. 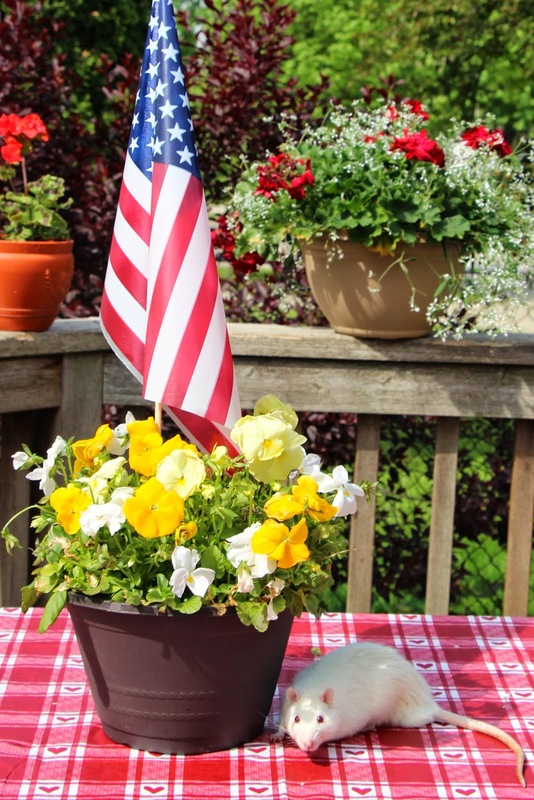 NOTE: Since these photos were intended to get a good Memorial Day picture, I originally wanted to use a pot of red and white geraniums, which would have been more patriotic looking. 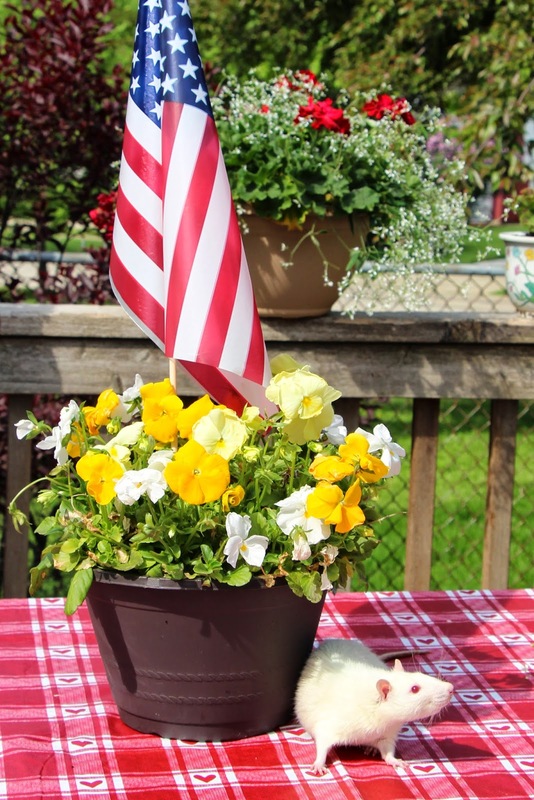 However, after researching geraniums on the poisonous plants list, I found them listed, so I switched to a pot of yellow pansies instead. 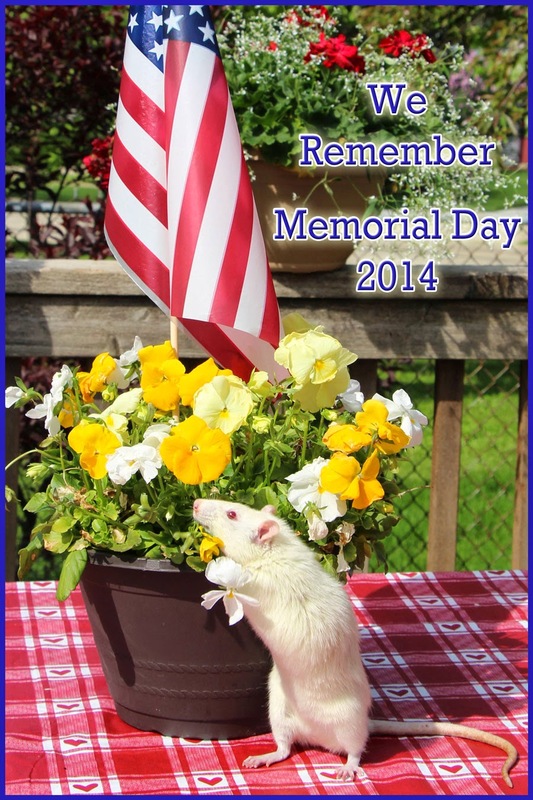 Not as patriotic as the geraniums, but non-toxic and safe for our ratties. 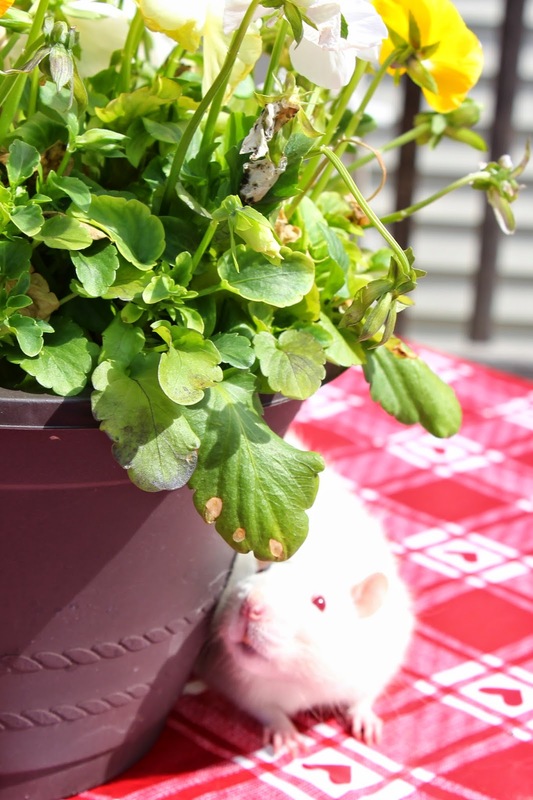 This is just a reminder to always check the poisonous plants list before exposing your ratties to live plants for photos or play. Even Wild Rats Love Dollar Stores! Okay, I normally ignore the stories in my Yahoo! News Alerts regarding rat infestations, but I just couldn't help sharing this one. 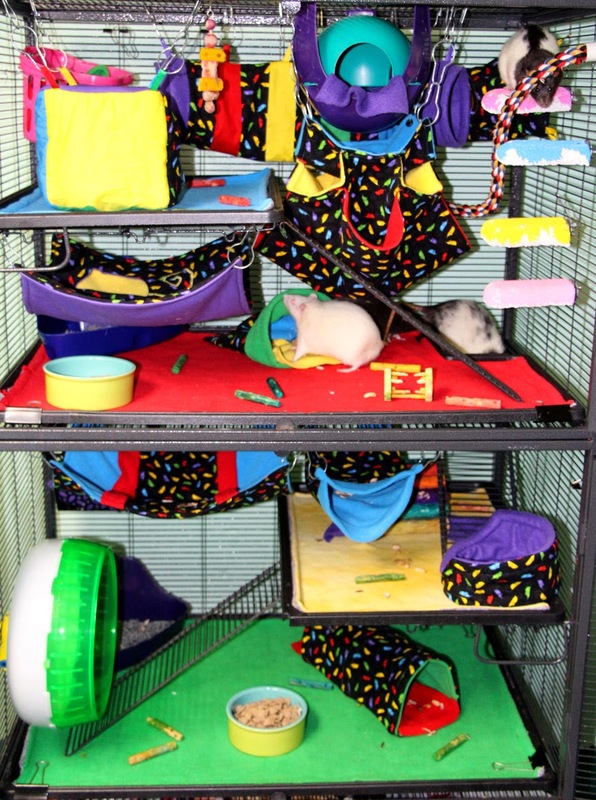 Our domesticated rats have known for years that dollar stores are the place to go for the best rat toys at the lowest prices. It seems the news has finally spread to their wild cousins and they just can't get enough! Wheel Running Isn't Neurotic: Wild Animals Love a Good Wheel Too! Scientists have sometimes pondered that running in a wheel may actually be a neurotic behavior induced by being cooped up in a cage too long. Of course, most of us with wheel runners know that our pets are not neurotic and that many actually enjoy a good run in the wheel (many big boys, however, prefer a nice long snooze in the wheel to an actual run). Now, a couple of scientists have gone the extra mile to see whether wild animals, if given the opportunity, would choose to run in a wheel. The answer was an overwhelming "Yes!" They set up a wheel in an outdoor garden area, then set up some cameras with motion detectors to record what happened. The found that wild mice just loved the wheel. And while mice were the most common visitor, they also had rats, moles, frogs, and even snails and slugs work the wheel at least one revolution around. The article included a brief video of a mouse in the wheel, but I did a little digging and found another video including more mice, a frog, a slug, and a snail: Wild Animals Caught on Hamster Wheel. Worth watching if you don't mind putting up with the 30-second ad that airs before it plays. I don't know about you, but I suddenly have an irresistible urge to setup a wheel along the back fence of our backyard, hook up a webcam, and see what happens. On Friday, Bela went in for her second recheck for a respiratory infection. I had caught it early and brought her in three weeks ago at the first sign. We treated her aggressively with Baytril and Doxycycline. At her one week recheck, she was much improved. The second week of treatment, she was fine. The third week, her symptoms returned - this time, worse and persistent, despite still taking the antibiotics. After listening to her lungs, the vet decided an x-ray was necessary. When she returned with Bela, she had bad news for me. For the second time in one week, I had brought in a rat for a respiratory infection, only to find out we were dealing with a lung tumor. You can imagine how surprised and heartbroken I was to get this very same diagnosis, not once, but twice in just a three day period. Bela's tumor is less advanced than Casper's and she likely has more time, since it was caught earlier. We are treating with a steroid (Prednisolone), plus doxycycline to prevent secondary infections, since the steroid weakens the immune system. We also decided to try the same for Casper, although his tumor is more advanced and the steroid is something of a Hail Mary pass. How Common Are Lung Tumors? Should We Do More X-Rays? The shock of having two lung tumors diagnosed in one week got me thinking. I had always thought this was not a very common problem. I knew it could happen, but it is not the first thing I would suspect when a rat comes down with respiratory symptoms. I have now had three rats diagnosed with this problem - each time it was caught on an x-ray. It makes me wonder how often this is missed because no x-ray was performed. It made me wonder about Mystery, who passed from chronic respiratory problems. After a while the meds didn't help. Had we done an x-ray, would we have found a tumor there, as well? My experience is making me wonder if we shouldn't do x-rays more often. Not for those initial mild symptoms that are treated effectively without much fuss. But maybe for those rats who have frequent recurring respiratory symptoms. Maybe for those who stop responding to the antibiotics. Maybe, before we go to all the stops with various meds and trying this and that, we should do an x-ray. Bela's initial diagnosis of respiratory infection was, in fact, correct. However, the respiratory infection had occurred secondary to the tumor. When given meds, the respiratory infection cleared up rather quickly, but because it was just a secondary problem, the root cause being the tumor, the symptoms returned and the meds were powerless to help. X-rays always make me cringe because I know they come with a cost. But with Bela, I am thankful that we did it early. Catching a tumor at this stage has saved me several recheck visits, along with more antibiotics and higher dosages of those meds. Doing the x-ray early actually saved me quite a bit of money, and early diagnosis means there is a chance that the steroids will stall the tumor growth and we will get more time. I also am prepared for what will inevitably be coming. 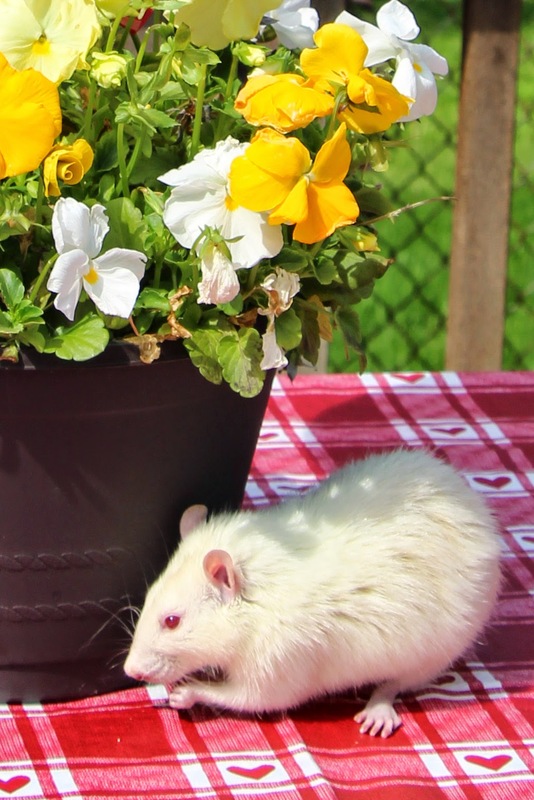 This diagnosis is a reminder of why it is in our rats' best interest to NOT throw antibiotics willy nilly at every wheezy rat, but instead, to see a vet when they become ill. I know there is a whole community of rat lovers who will treat respiratory infections at home without the guidance of a vet. I know there are ways to get prescription medications illegally online or to use medications meant for a different species in an off-label way, or to just save leftover medications to try to treat yourself. I choose not to go this route. Everyone must make up their own mind, but these are some of my reasons, and if they influence others, that is great, and if not, at least you go into it aware of what is at stake. 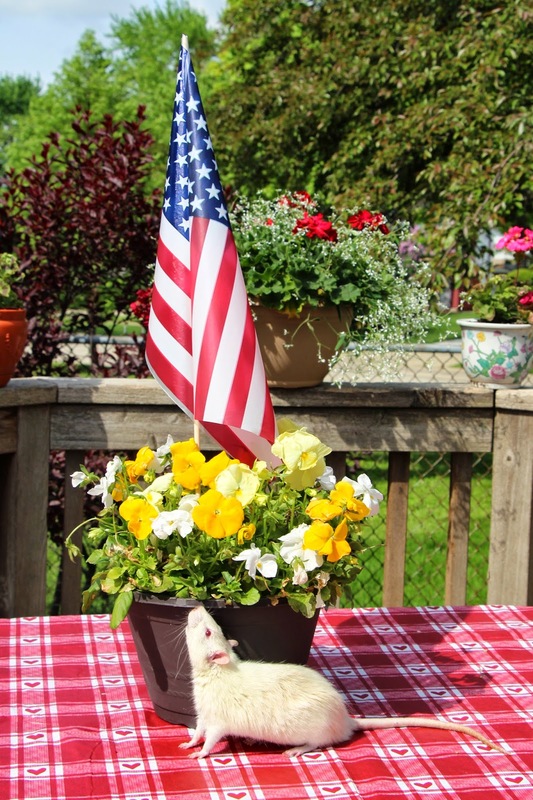 Home treatment without the guidance of a vet carries risks. You are at risk of using meds that have expired, that are unsafe, or even not what is advertised. You are at risk of making an error in the dosage calculations. 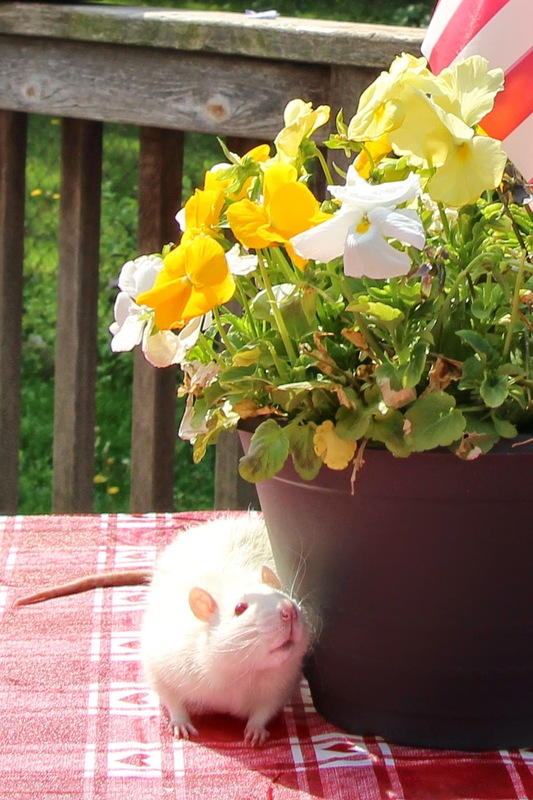 Some medications are safe for some rats but not for others. For example, Baytril is unsafe for rats under 4 months old because it can cause cartilage problems. Vets are better educated in these special cases. Most of all, you are at risk of treating for the wrong thing or with the wrong medication. While you are doing that, your rat is getting sicker; his prognosis, worse. When you finally do see a vet, it will cost you more money and will be harder to treat. We always assume that respiratory symptoms are caused by respiratory infections. But as I have seen, that is not always the case, and even when it is, respiratory infections are opportunistic infections that often crop up secondary to another health problem. For example, Pirate developed a respiratory infection secondary to salmonella poisoning. Treating the secondary problem doesn't do much good if you don't treat the source. Treating yourself and getting something wrong is a waste of money that will only lead to spending more money down the road, risking the health of your rat as the actual problem goes untreated for longer. The other thing to keep in mind is that rampant consumer use of antibiotics without the guidance of a vet leads to antibiotic resistance down the road. I have seen this already happen in the bird world, where many antibiotics are legally available for consumer use. Many of the broad-spectrum antibiotics carried by pet bird suppliers now have absolutely no effect on anything. They have been overused and misused by too many people over too long a period, and everything out there is resistant to them. To replace these now useless antibiotics, pet bird supply vendors are starting to carry more potent antibiotics, and one of those is Baytril (intended for use in chickens, but sold by pigeon supply stores, and now pet bird suppliers, and marketed to pet birds). This concerns me. When consumers use antibiotics, there is inevitably a large portion of the public who use them incorrectly. They will use them for the wrong thing. They will use the wrong dosage. They will use it for the wrong period of time - stopping after symptoms resolve or stopping when it doesn't seem to be working. They will use it too often, when not even needed. 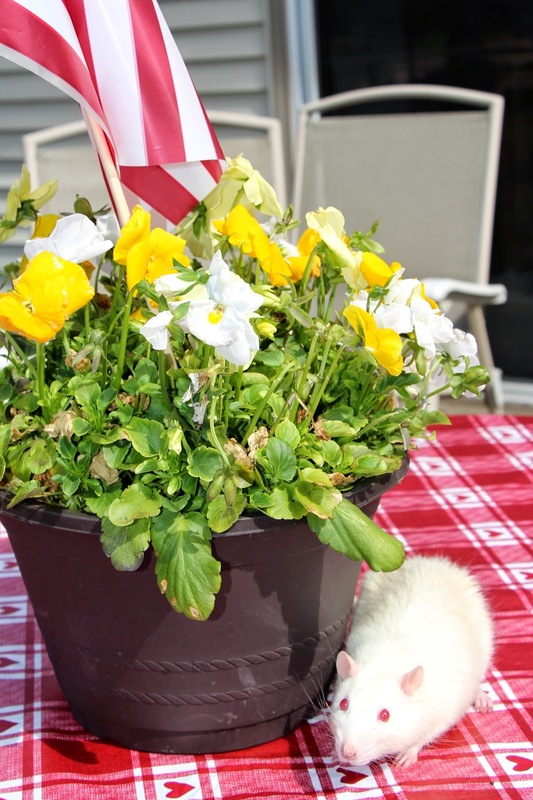 It is not uncommon for a rat to be a little sneezy just because of environment (allergies, new home sneezes, dusty bedding). The more available antibiotics are to consumers, the more consumers will throw an antibiotic at every little dry sneeze. They will use it preventively or as a quarantine measure. You may not be that person, but you can bet than there are many out there who are, and they spoil it for everyone. The bird community has proven it to be true. It would be nice if everyone was as knowledgeable as a vet with regard to diagnosis, dosages, and proper use. Unfortunately, even when we have mastered the latter two, the first will always be trumped by an experienced vet, and many, many people will get all three wrong. I know it happens sometimes where people end up in tight situations where they just cannot afford a vet, and then they feel they have to resort to home treatment. I never have any advice for this situation. The truth is, if you are truly in that spot (no money to be had anywhere, no credit, nothing to sell, no way to earn money, no one to borrow from), it is too late. It does no good at that point to say, "Well, you should have done XYZ" because we can't go back in time and fix it now. 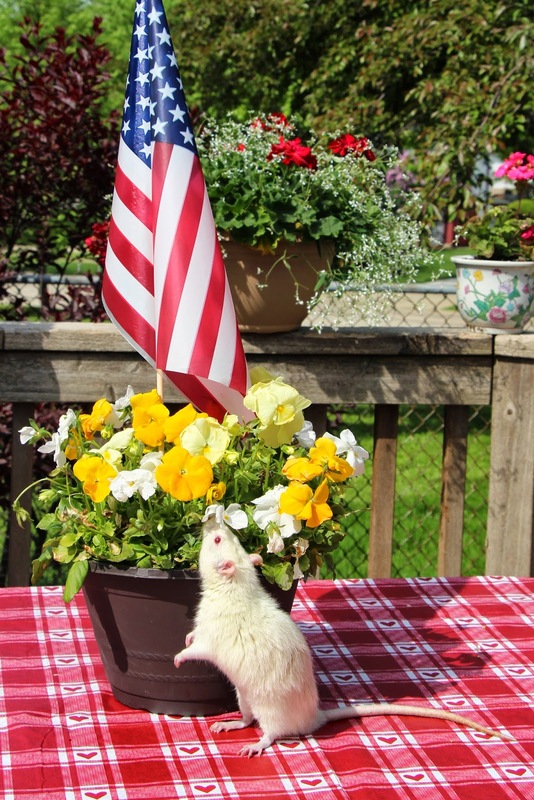 Instead, I offer advice for everyone not in that situation today, with the hope that there will be fewer people in that position tomorrow: Start an emergency vet fund now, even if you don't have rats yet - in fact, that is when you should start the fund - before you have rats. Fund it generously. Never borrow from that fund . . . ever! Remember it is an EMERGENCY vet fund - don't use it if you don't have to - pay your vet bills from your regular budget if that is an option. Replenish that fund in a timely manner before it is needed again. Apply for Care Credit if there is a chance you ever might need it, so that you can finance a vet appointment now and pay it off gradually should the need arise. The only good solution for this problem is to take steps now to make sure you never have that problem. It is like the movie War Games: The only way to win is not to play. Unfortunately, if you don't take those steps before they are needed, it is too late once you end up there. Casper had his vet appointment yesterday, and unfortunately, we received some bad news. The vet listened to his lungs and thought something was not right. She did an X-ray and we learned that Casper has a large tumor in his lungs. The mass is so large that his intestines have been pushed to one side, and she believes it is starting to spread to other organs. This is heartbreaking news for us, even though he has only been with us for a few days. He is such a sweet boy that we instantly fell in love with him and none of us want this for him. It is so sad that rats are prone to these kinds of problems. Casper really deserves better than this diagnosis. But there is nothing that anyone could have done. He probably doesn't have much time, but the good news is that so far, he is not suffering and not in pain. He still is lively and alert and inquisitive and enjoys play time a lot. But it explains his labored breathing and his lack of appetite. He has been taken off the antibiotics since he did not have a respiratory infection after all and the meds won't help with the tumor. Keep him stress free. 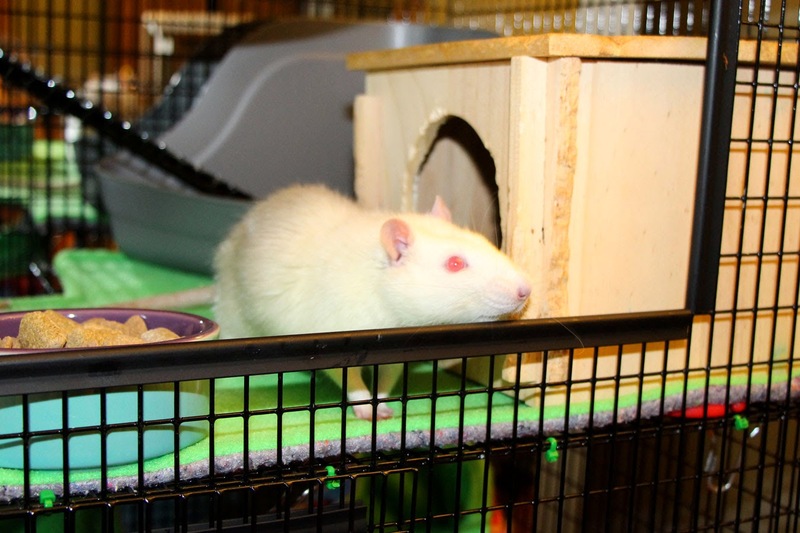 Unfortunately, this means he will remain a lone rat as introductions would be too stressful and the other rats may sense the cancer and reject him. Spoil him rotten and give him yummy soft foods - anything that he will eat. While he has not been eating his block, he will accept yogurt, oatmeal, baby food, and some people food like chicken, mashed potatoes, bananas, pasta, etc. He has also started sampling from the cereal/seed mix I gave him. Give him lots of attention and out time, but also plenty of time to rest so that he doesn't over-exert himself. We will be giving him lots of love, attention, and good foods. This is a good reminder for us all that not all respiratory problems are respiratory infections and that we should be aware of other potential causes for respiratory symptoms. This is our second rat to have a mass in the lungs - Pirate passed away from this same problem last year. I received a request for a tutorial for the 3-D Tunnel to which I have been a little slow responding. 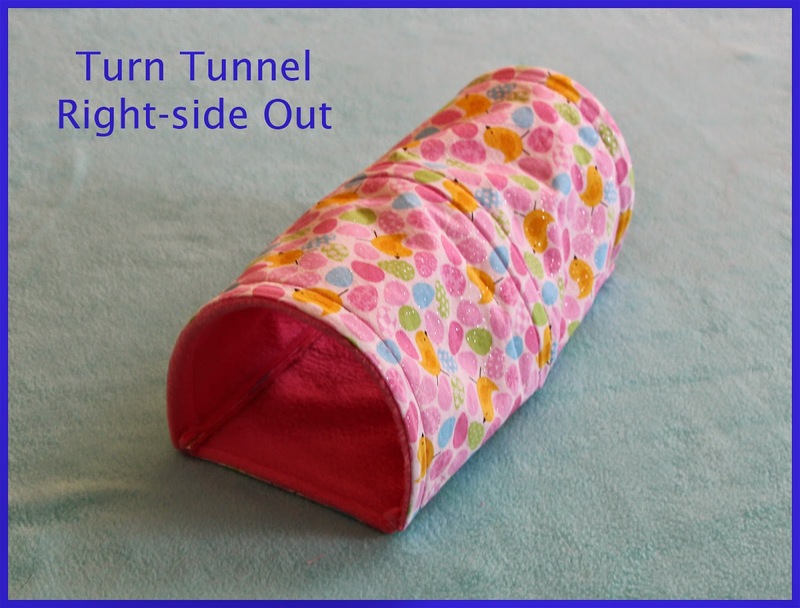 I would like to make two minor modifications to this tunnel: one that would sew the Rigilene to the fabric once it is inserted so the rats cannot chew a tiny hole and then pull the entire strip out (yes, my rats did this to one of their tunnels), and one that would add a strip of Rigilene across the top so that the opening will not sag back toward the center when left unattended in the cage). I have not had time to experiment with those modifications, so I am posting the tutorial for the original design here in the mean time, while I try to find time to play with those changes. This tutorial is not yet available in the PDF document and will not be until I have played with the modifications I mentioned above. I will post an update when the PDF document has been updated with this tutorial in its finished form. This tutorial uses Rigilene for support. See the post Using Rigilene in your Hammocks for more information on Rigilene. 2. 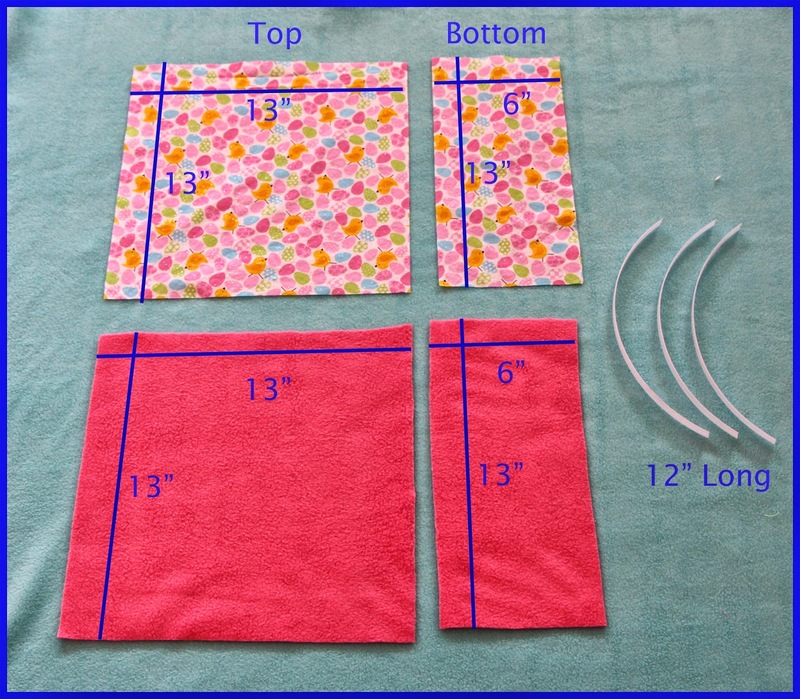 Place the two 13"x13" square pieces (fleece and cotton) right sides together. 3. Mark guidelines 3/4" from each seam (using chalk or a disappearing ink marking pen). Mark two more guidelines in the center between the seams, 3/4" apart. 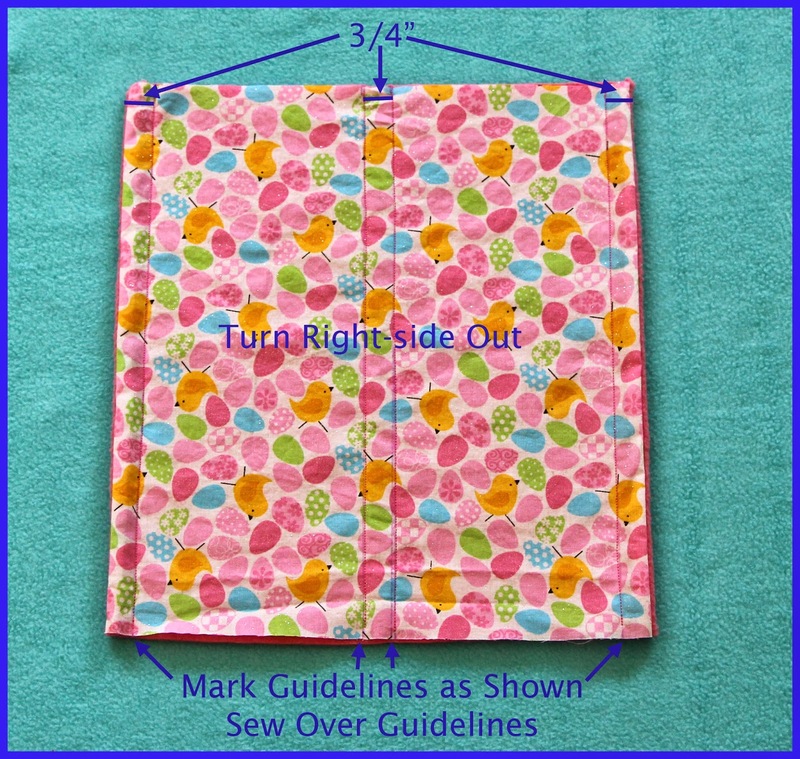 Sew along each guideline, making a channel for the Rigilene. 4. 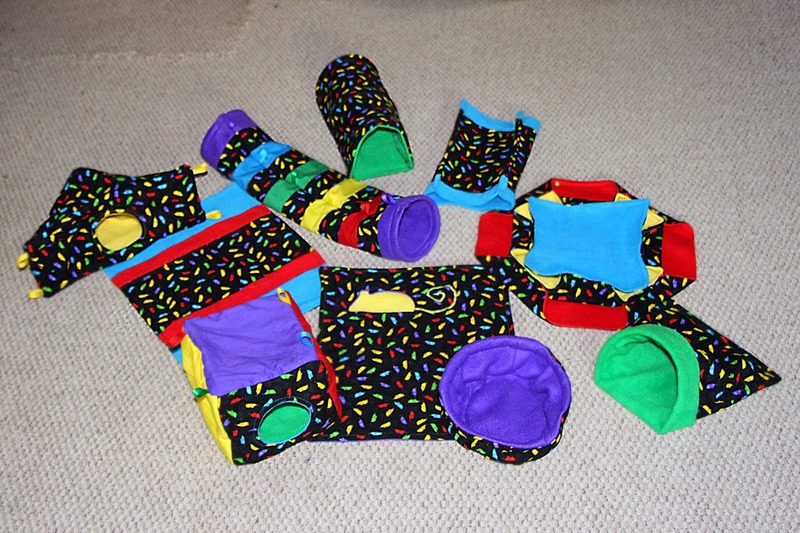 Place the two bottom pieces (cotton and fleece) right sides together. Pin along the short edges (this will be the opening of the tunnel). 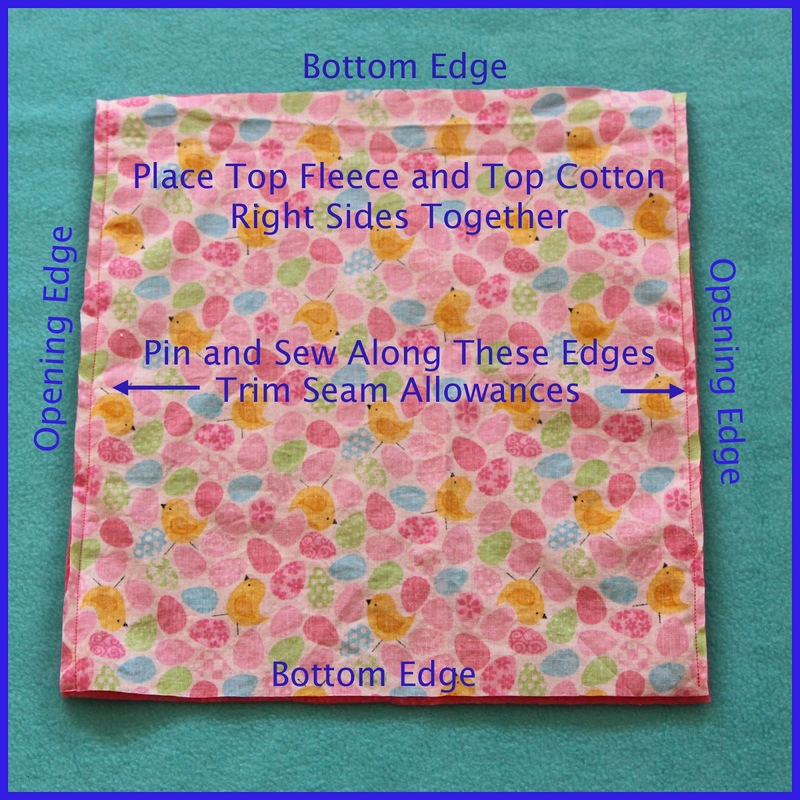 Sew along the pinned edges. 6. 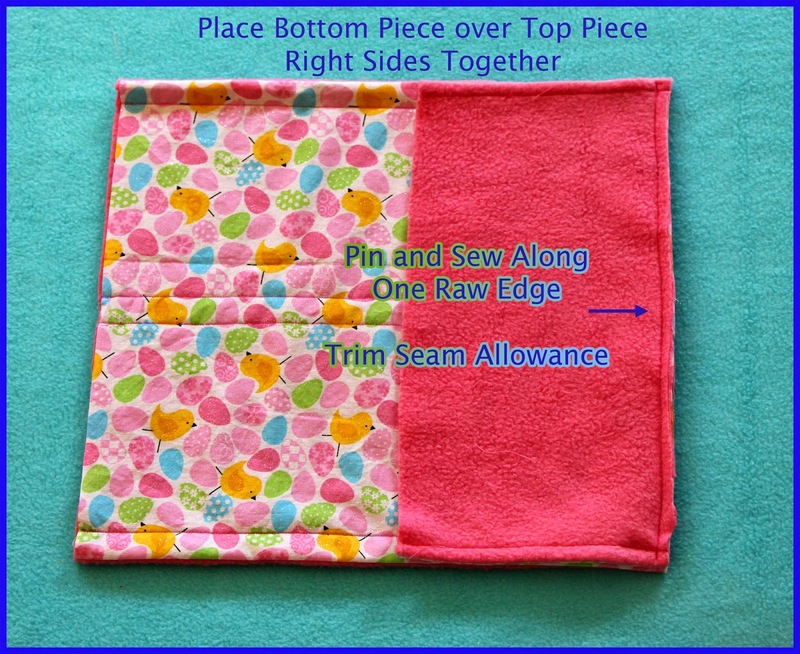 Pin the bottom piece to the top piece along a raw edge, right cotton sides together. 7. 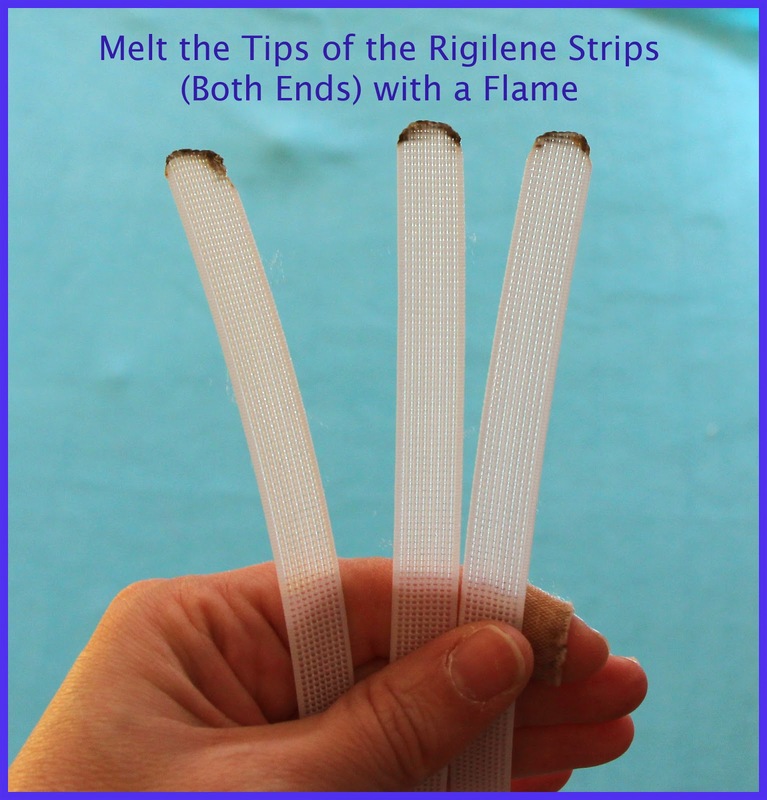 Melt the cut edges of the Rigilene strips using a match or candle lighter until they are smooth with no jagged edges. Jagged edges will tear through the fabric in the wash. Note: ideally, melt the tip without burning them, unlike what I did below. If they catch fire, blow them out quickly. Do not do this in the same room with your rats as it releases fumes into the air. 8. 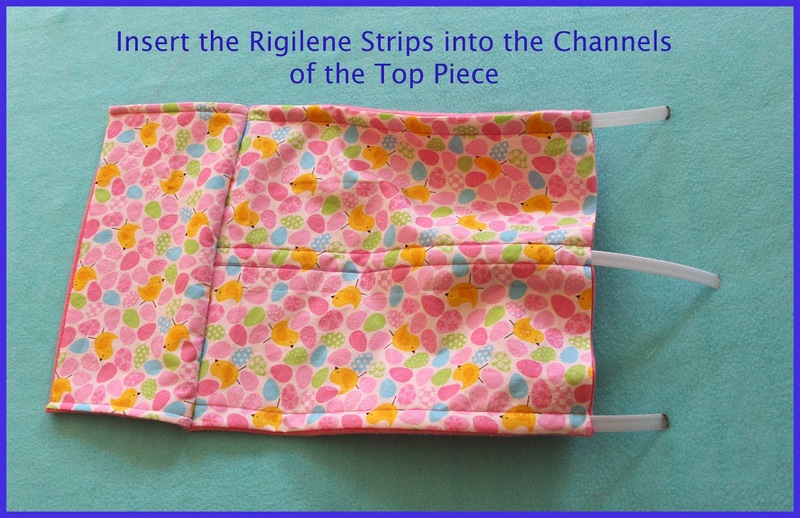 Insert the Rigilene strips into the channels in the top piece. 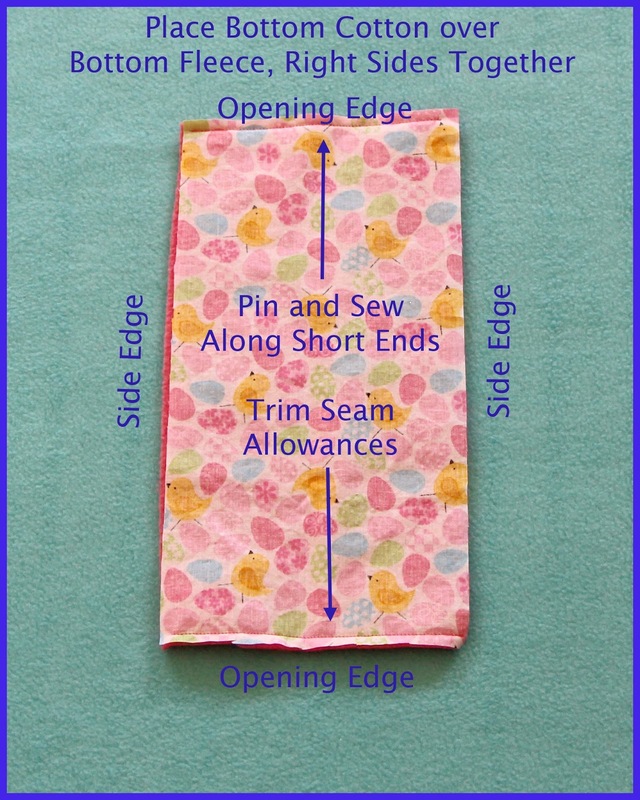 There should be at least 1/2" of extra fabric at the raw edge for the seam. 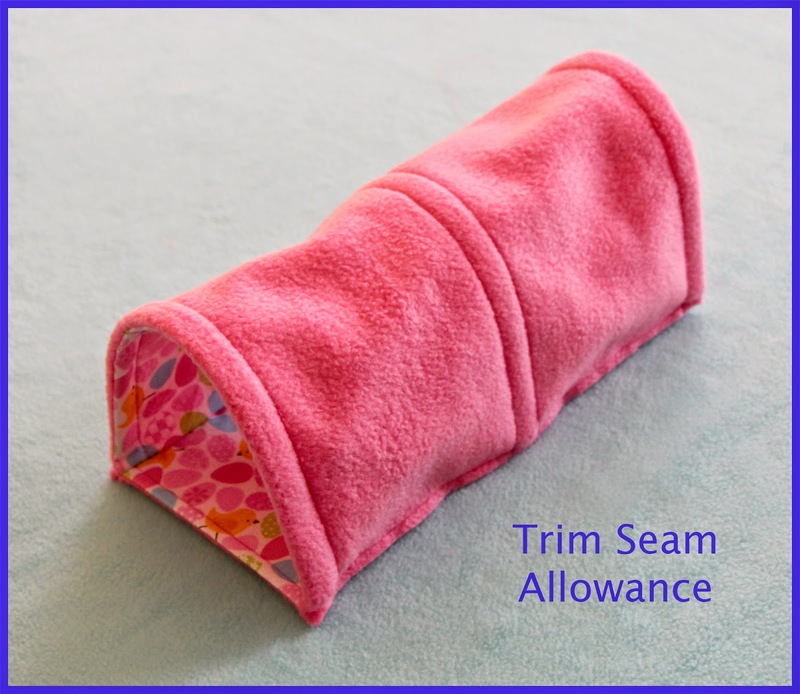 If there is not, you may need to trim your Rigilene to make the strip a little shorter. 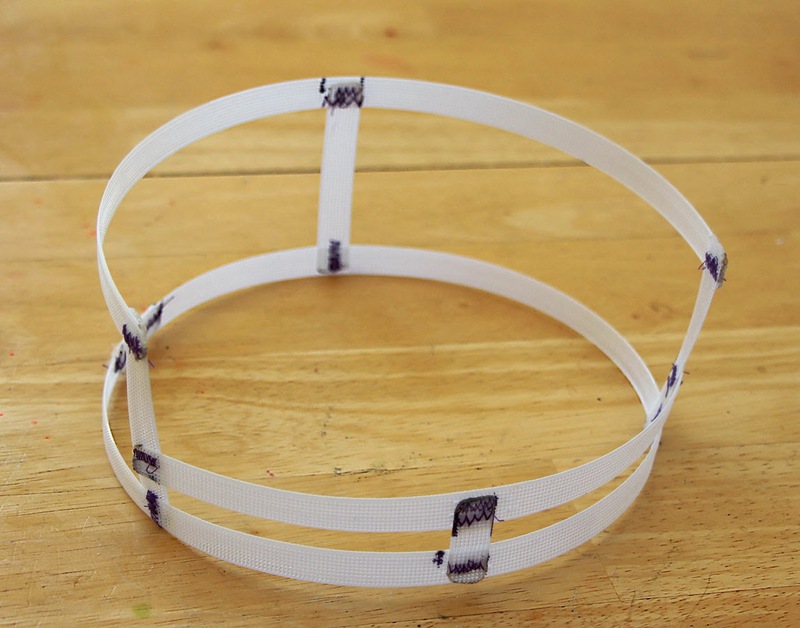 NOTE: At this point, you might want to sew over the Rigilene strips (either all the way across, or at each end or at the center) to fix the strip in place so that the rats cannot chew a hole and pull the entire strip out. 9. 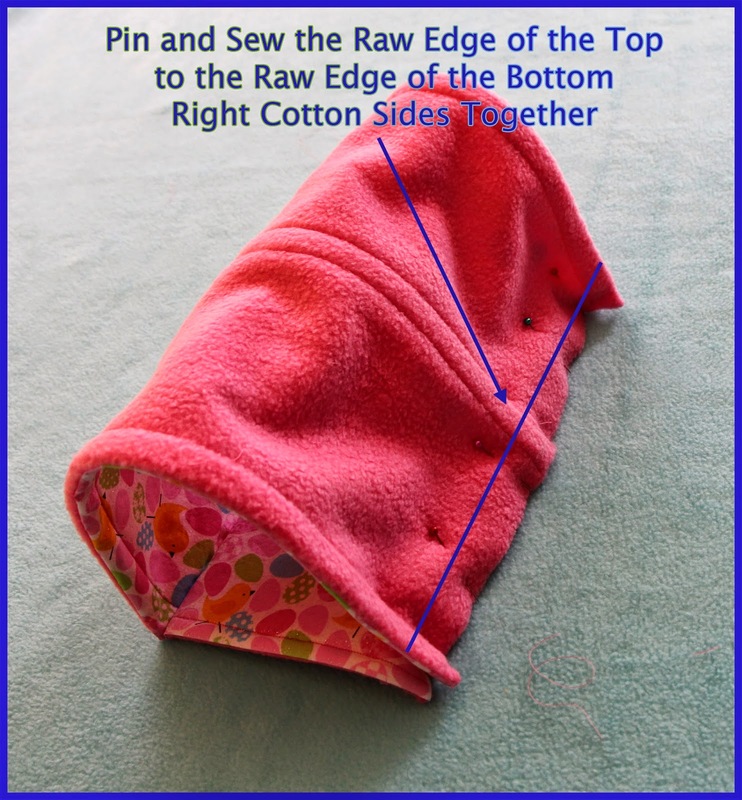 Fold the top piece back over the bottom piece and align the raw edges, cotton right sides together. Pin the raw edges together. 10. Sew along the pinned edge, making sure not to sew over the Rigilene strips. 11. Turn the tunnel right-side out. This is Casper. He is around 1 1/2 years old. I heard about him from a friend who volunteers for the Illinois Doberman Rescue Plus (Casper is a Plus!). He was looking for a new home because his mom has a very sick dog at home who needs a lot of medical care and TLC and special attention due to a rare infection, and she was not left with enough time to give him the time and attention he needs. 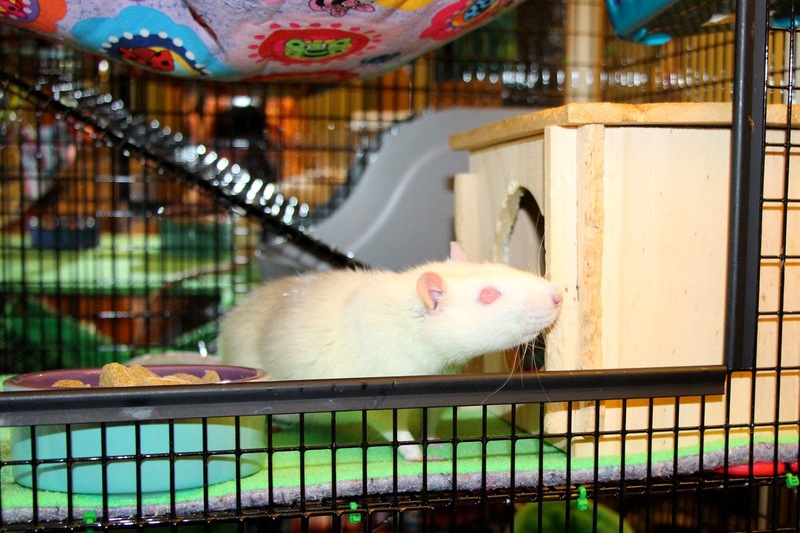 Casper has always been a lone rat, so he needs extra time and attention, and it was a hard decision for his mom, but she decided that his needs might be better met in a home that had more time to devote to him. 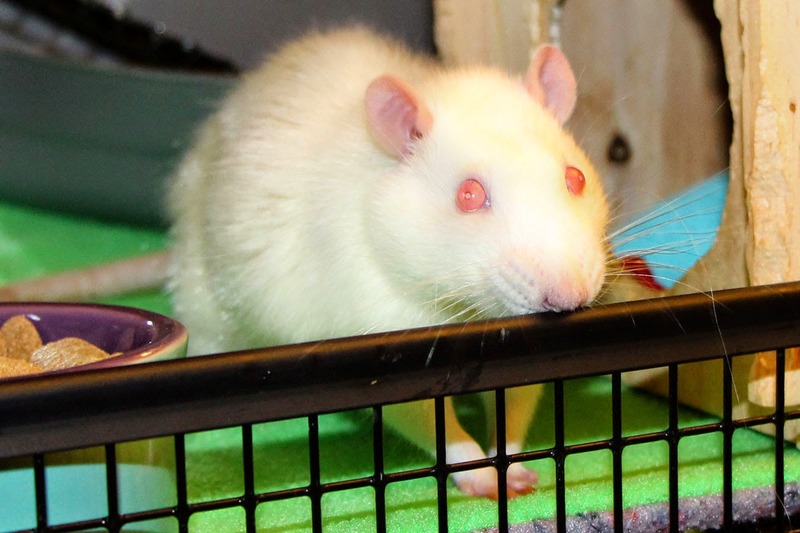 We were supposed to pick Casper up on Wednesday, but he developed respiratory symptoms that day and so his mom kept him for a few more days and started him on medication for a URI. We picked him up on Saturday instead and he is settling in. We have an appointment with our vet set up for him on Wednesday so that she can check on his progress. His breathing sounds okay to me most of the time, but he does seem to have extra heavy and somewhat irregular respiration that has me concerned. It may look worse than it is because he is a thin rat and so his breathing movements are more pronounced, but I am still anxious to have our vet take a look and see what she thinks. The heavy breathing gets worse when he exerts himself a lot - so we are trying to keep him calm and stress free as much as possible. We are also trying to get him to eat a little more. 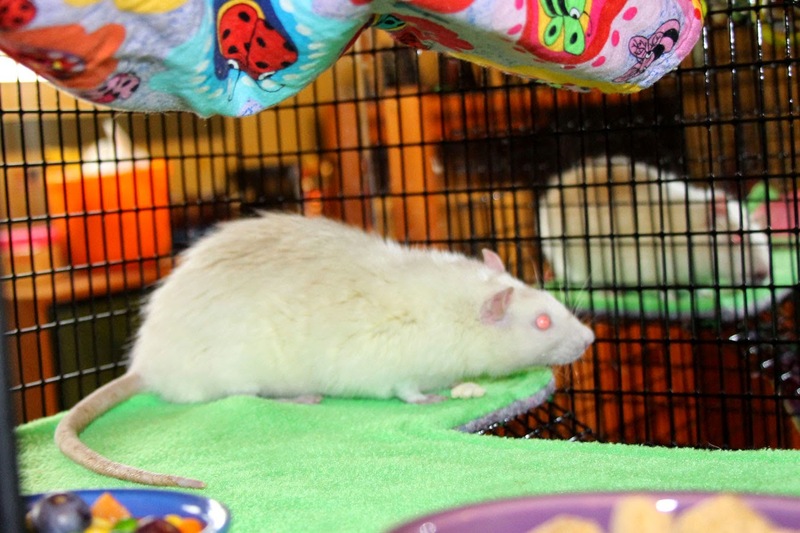 His owner explained that he has always been a thin rat, but I am concerned because there is little buffer for him to lose weight if he should become ill. I believe he has been eating his rat block, but not around me - mainly at night. However, he is not very interested in snacks. He usually rejects things like cereal and most of the veggies I have offered. He does like lettuce and has sampled grapes and bananas and the occasional pea. He likes yogurt and oatmeal and took a little piece of chicken this morning and some scrambled egg. So he is eating, but not as much as I would like. It may just be that he needs to become familiar with the different foods we are offering, and I am trying to mix it up and try different things to see what he will accept. 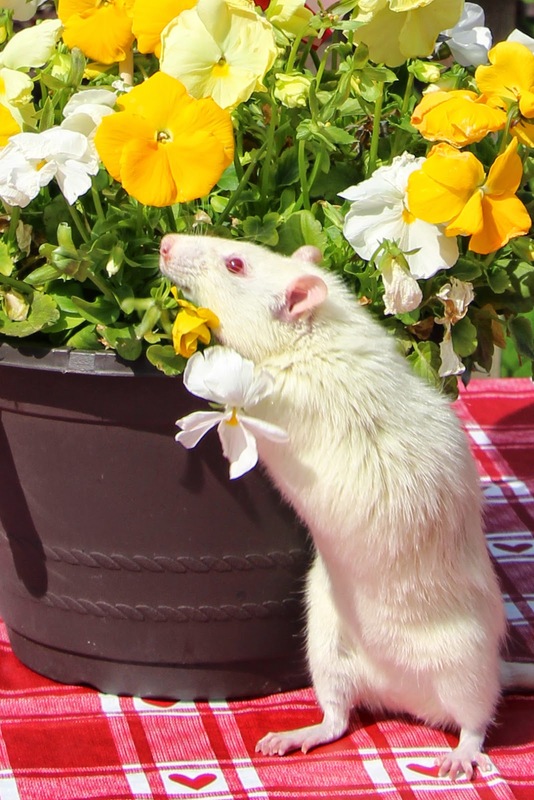 It also might help if we can introduce him successfully to our existing rats because rats often learn what is safe and yummy to eat by watching what other rats eat. However, I don't want to begin with anything stressful like introductions until we know more about the state of his health. Since stress seems to lead to fast breathing, I don't want to even touch on that until he has seen our vet and has been cleared for that. Emotionally, he seems to be adjusting to a new home really well. 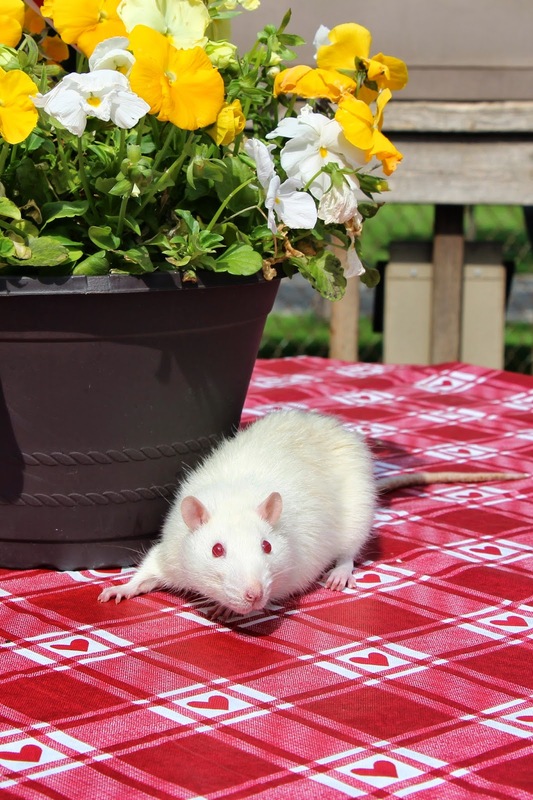 He is incredibly friendly and gentle and loves to explore during out time. He especially likes the rat tubes and runs through them and on top of them and will stop to rest inside of them. He doesn't seem to care for hammocks and likes to sleep out in the open. I added more huts to his cage instead, but he still seems to prefer the open, although I have caught him resting inside the cube or in one of the wooden huts on occasion. They are being recalled for a high moisture content leading to a potential small larvae infestation of some sort. Opened and unopened bags can be returned to the pet store for a full refund, regardless of whether you have the receipt. Note that so far, I have not found an official press release about this recall. As far as I know, it only affects the Mouse and Young Rat formula and not the Adult Rat formula. I will keep an eye out for an official announcement online and will update with a link when/if I find one. Feel free to post a link to an official link in the comments if you find it before I do. At Oxbow, providing a premium quality product to pets and the people who care for them is a cornerstone of our foundation. Much to our dismay, we recently discovered that select Best By Dates of our Essentials Mouse & Young Rat Food do not live up to our stringent quality standards. These select Best By Dates of this product contain higher moisture than what our recipe calls for. Excess moisture may cause food to mold, similar to what a loaf of bread might do in the same situation. The select Best By Dates are: JAN 10 2016, JAN 25 2016, FEB 28 2016, MAR 14 2016, and APR 4 2016. The root cause of the problem was quickly identified, and it is isolated to these specific lots of Essentials Mouse & Young Rat Food only. Steps were swiftly taken and additional quality control points implemented to ensure this situation does not occur again. Please be assured that we have not received any reports of harm to animals or humans in relation to this situation. There are no other products or Best By Dates affected by this excess moisture content. We are in the process of voluntarily withdrawing these select Best By Dates of Essentials Mouse & Young Rat Food from distribution. We deeply regret the inconvenience this has caused for our pet parents and their beloved companions, our retailers and distributors. 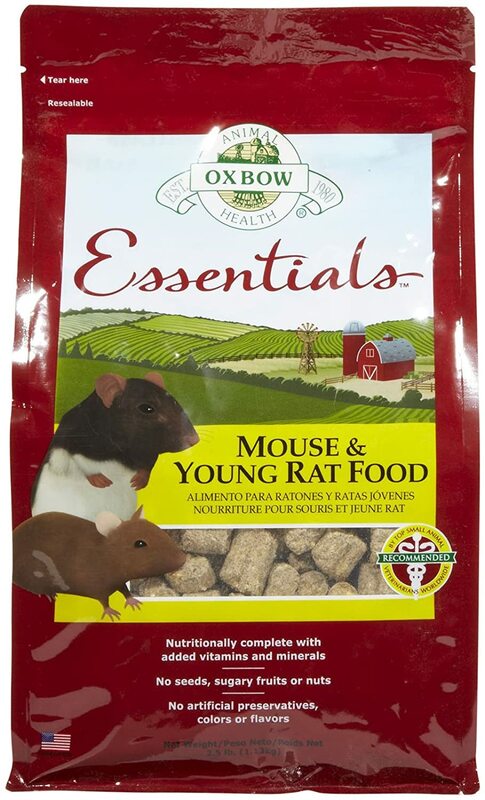 If you have a bag of Essentials Mouse & Young Rat Food from one of these Best By Dates, please contact Oxbow for a replacement.